The last decade has been a tumultuous one for theAmazon rainforest, the green lung of the planet. On the one hand, the hand that wields the ax has been stayed somewhat - with the rates of deforestation last year at their slowest pace in 20 years. On the other, fierce 'once-a-century' droughts have gripped the lush basin not once, but twice. Some see the lurking shadow of global warming behind such an ill-starred run of searing dry seasons. What is for certain is that the planet can ill-afford for this global gobbler of man's CO2 to dry, shrivel and shrink - whether by ax or fire. But while scientists can't step in to banish these twin threats, they can hold out the promise of foretelling signs of the next gathering drought. That's according to the results of a new study by climate scientists, published in Science today. 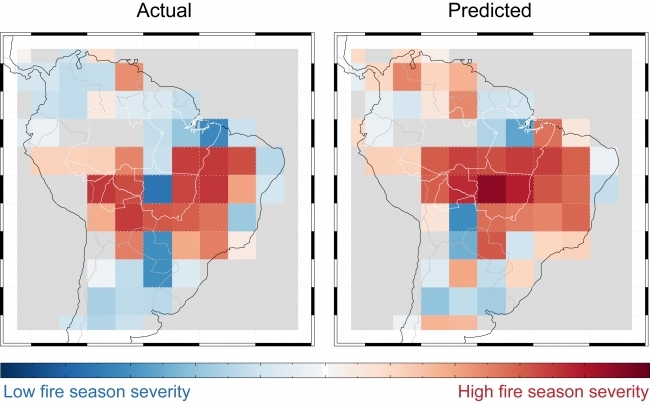 With advance warning, those tasked with conserving the Amazon may be able to prevent the worst effects of such droughts, by putting a damper on their potential for wildfires. In order to act as modern-day augurs of these devastating droughts, the team - led by University of California, Irvine (UCI) - cast their eyes far afield, to the waters of the Pacific and Atlantic oceans. By watching the tremors of temperature over some three decades, in waters thousands of miles from the Amazon basin, they were able to pick up subtle signs that predicted the droughts - up to five months before they struck. 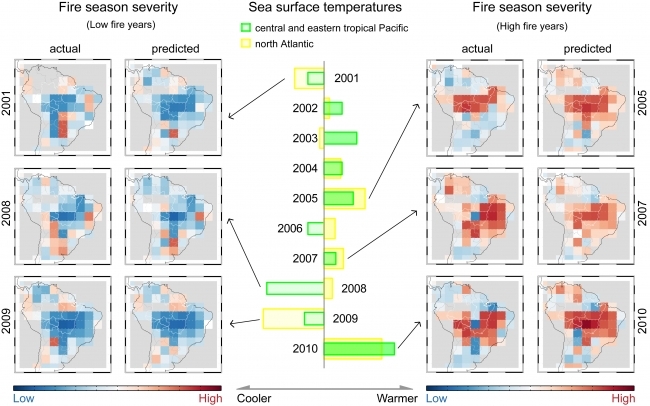 In the years when then the temperature of the central Pacific rose by a degree Celsius - and those in the Atlantic by a quarter of a degree - wildfires bloomed across the South American rainforests several months later. The researchers were able to produce models that accurately predicted the devastating fires of the 2010 Amazonian dry season. "We predicted a massive spike in fires in 2010, and it occurred," said James Randerson, one of the paper's authors from UCI. Because there is a reasonable lead-time for their omen-casting, it gives those on the ground a fighting chance to take action. For example, fire-fighting teams can be placed in known flash points; or controlled burning of conflagration-prone areas can be undertaken - hopefully preventing raging wildfires from taking hold across wider swathes later. "During the 21st century, there are expectations that drought may intensify, and forests may become even more vulnerable. Understanding in advance whether you're going to have an exceptionally bad year will become critically important for managing them." Given the desperate importance of holding onto those parts of the globe, such as the Amazon, that absorb much of our rising CO2 emissions, the need for such climate-oracles has never been greater. But with the bones also speaking loudly of a wider, more globally-ominous future, are we actually listening? Martin Leggett has more climate musings on his blog Wyrd Climate.